Electronic Digital Target Compatible with Nerf Guns, Keten Auto-Reset Shooting Scoring Targets with Intelligent Light Sound Effect for N-Strike Elite/Mega/Rival Series (Target Only) . 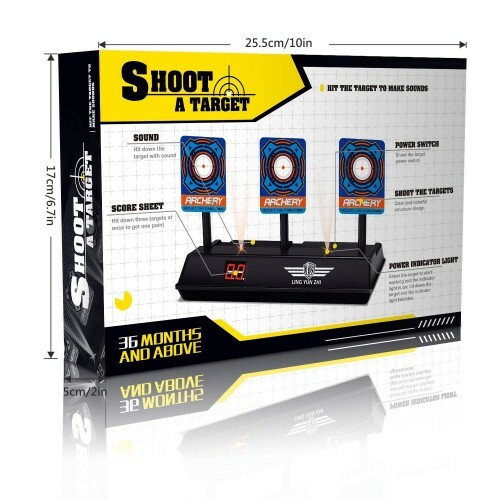 The smart electric score target is designed with the Electronic Intelligent Sound&Light effect, Automatic rebound, Fast return and Electronic scoring for the competition. It fits for Nerf N-Strike Elite/Mega/Rival Series blaster, water gel beads blaster, BB Guns and other soft bullet toy gun. An attractive outdoor game for your little boy and girls, it's also great for teens and adults! 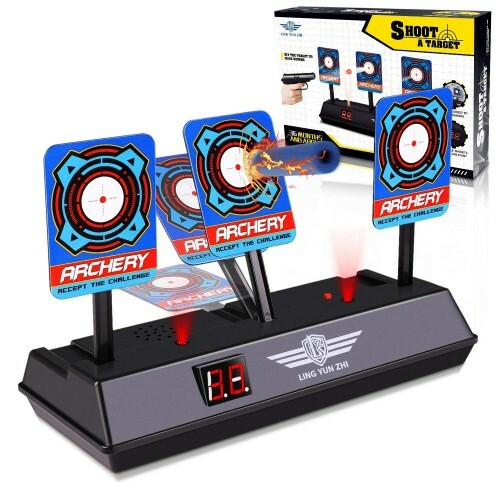 ELECTRONIC SCORING - Digital scoreboard tracks and displays score; it will fall down when hitting the target and hit 3 targets to get 1 point. Perfect for Nerf guns N-strike Elite/Mega and Rival Series. AUTOMATIC REBOUND INTO POSITION - Target internal powerful electric gear design. When all three targets fell, the strong electrical chance drove all three targets automatic rebound into position after 3 seconds. SOUND&LIGHT EFFECT - Electric scoring target has flashing light accompanied by simulated gunshots and broken glass, sound&light effect encouraging the shooter (AA batteries not included). Whether solo or team game, automatic self-standing target is the exciting challenge for athlete of all skill levels! FUNNY SOLO OR TEAM GAME - Digital target can be used as a solo shooting training to improve the aiming. It can also be competing out with friends and have a competitive game of target scoring. PERFECT GIFTS for KIDS - Suitable for children above 3 years. 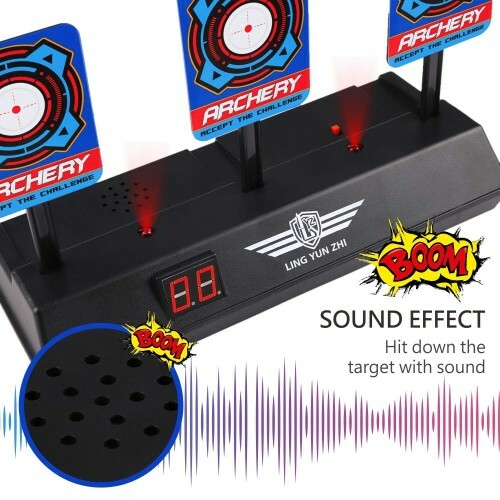 Electronic Target promotes parent-child communication and exercise children's shooting ability and we offer a lifetime warranty on this digital target toy.